This is just a quickie. 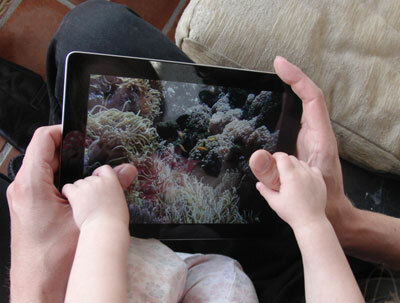 Here is a photo of Bibsey attempting to interact with an aquarium app on the iPad. She likes to use Daddy’s thumbs to actually work the device. Why use my own thumbs, when Daddy's will do? She has taken this kind of interactivity to its not-so obvious conclusion today by using Mr B’s hand to stroke a real live dog. Should we charmed or worried?